Those who attended the finale performance of “The Wishing Tree” at H’art Centre on Sunday December 9th had their hearts warmed despite the cold temperature outside. In addition to experiencing the heartfelt and joyful performance of the differently-abled performers from H’art Centre, the audience shared in a special moment as Catherine and Greg Bell presented the inaugural award from The Brook Catherine Doseger Endowment Fund. Greg Bell spoke lovingly and emotionally about Brook and the Fund that they created at the Foundation in memory of this kind, generous, and passionate young woman to continue to support work that was meaningful to her during her short lifetime. “Brook’s Fund” supports the training of future facilitators of accessible arts for people with disabilities through an annual award given by H’art Centre to a post-secondary placement student who best exemplifies the philosophy, focus and joy of the H’art Centre in its work with people with developmental and physical disabilities. 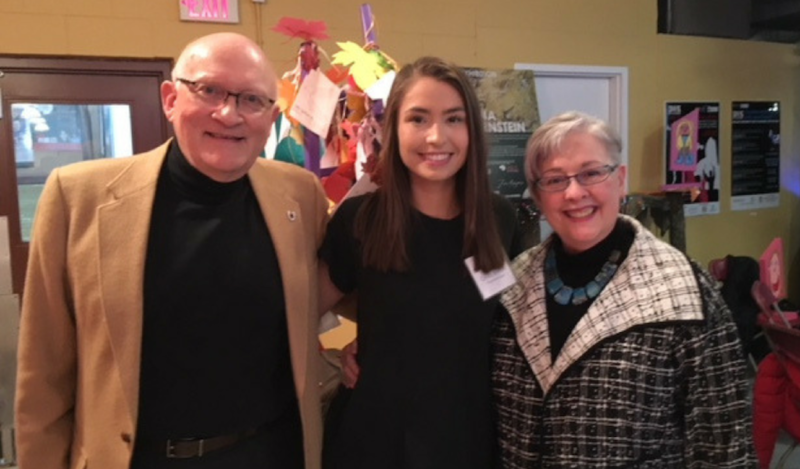 The inaugural award was presented to Olivia Breton, a third-year Child and Youth Care student from St. Lawrence College. Congratulations, Olivia! On a personal note, I was honoured to have been invited by the Bell’s to participate in this meaningful moment with them. It was truly heartwarming to share this experience with them, and to see their vision for Brook’s Fund coming to life. To read more about Brook Catherine Doseger (1992 – 2016) and her Fund, click here.